Can anybody please help me with how to place a datum plane, tangent to a cylindrical surface and at an angle to a specific plane? Hi, i don't think you can, not without first creating an angled plane passing through the axis of rotation, then making the required datum tangent to the cylinder, parallel to the angled plane, first created. Alternatively, make a sketch, & create a datum through it. As John said, create a sketch and set the datum up to the sketch unless you can live with only 0/90 degrees as Matt shows above. 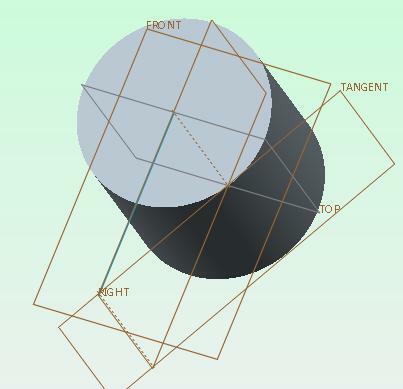 I just submitted my sketch method of creating a tangent data plane with regard to the a cylindrical surface. 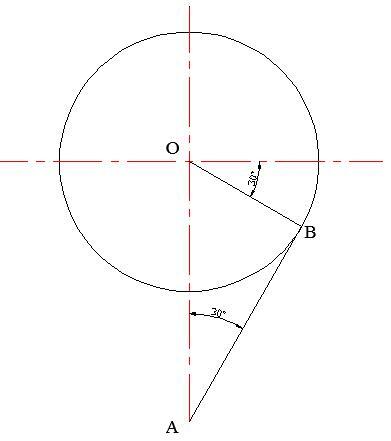 First of all, we extrude a cylindrical pillar, the diameter is 100, then we should select the top section surface to analyze as follows the picture 2, we set the tangent angle is 30 degree, obviously, the OA distance is equal to 2-time the OB distance, therefore the OA=100, we use the RIGHT PLANE to sketch the line in CREO2.0, that is to say, sketch the OA line, simultaneously sketch the axis through A end, then we use the axis and the right plane to create a tangent plane, modify the angle is 30, okay! certainly, the angle may is free,but is a fixed angle. I'm voting for Matt's method. No sketches and on-the-fly datum creation. One reason I like it is that the tangent plane is quite stable in this orientation to a full rotation value from 0 to 360 degrees -without reversing-! Normally tangents are quite unstable but in this case, it is remarkably (note the remark here ) stable. Just take the drag handle for the angled plane (within the cylinder) and the tangent plane follows -perfectly-.